The Flag House was featured on the Maryland Humanities Council blog on May 25th. Preview the post below or follow the links below to see the full article or listen to the History Corner podcast version of the story that aired on June 7 on WYPR. 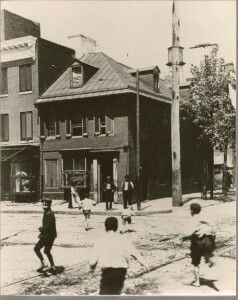 You have probably passed the three-story brick house standing at the corner of Baltimore’s Pratt and Albemarle Streets numerous times on your way east along Pratt Street or walking toward the Inner Harbor. Walking by, you may have missed the bronze plaque designating the building as a National Historic Landmark, and you might not have realized that this more than 200-year-old building is the birthplace of the most famous American flag to ever fly. Read the rest.